LOS ANGELES, California – Can you have a personal relationship with a digital mixing console? Michael Abbott seems to believe so. Abbott, who has provided audio engineering for iconic shows including the finale of “Survivor,” “The Voice” and “X Factor,” as well as the annual Grammy and CMA Music awards broadcasts, and has been entrusted to mix the audio for several critical American Presidential debate broadcasts, has been close to HARMAN’s Studer Vista 8 Digital Live Production Console since its introduction six years ago. 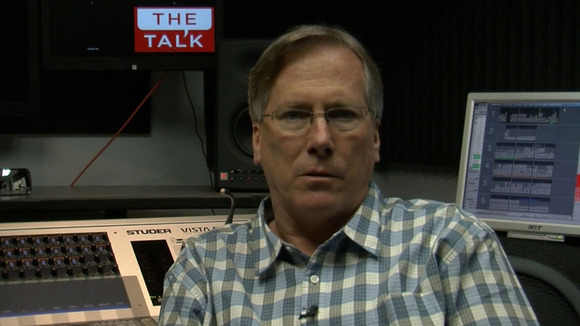 Currently, he has been working with the Studer Vista 8 on “The Talk,” a hit on the CBS Daytime lineup featuring Sara Gilbert, Julie Chen, Leah Remini, Holly Robinson Peete, and Sharon Osbourne discussing the day's latest headlines. "I've been fortunate in my career to have worked with many different kinds of Audio platforms," says Abbott, "but nothing has ever come close to what I can accomplish on the Vista 8." Produced and mixed at CBS's Bradford stage in Los Angeles, The Talk is a fast-paced daily program whose audio includes dialog, live and prerecorded music, audience and ambience effects, live feeds from other studios and remote inputs from around the world. It is, in short, the kind of show that only the Vista 8 can easily manage, thanks to Studer's patented Vistonics™ intuitive user interface. "On 'The Talk' I have 96 microphones, consisting of more than 20 RF handheld and lavalier microphones, 56 channels of music instrumentation, and audience reaction microphones. In addition, we have the occasional satellite remotes—'The Talk' covered the Royal Wedding a few weeks ago -- celebrity phone-in, eight channels of playout from the Grass Valley K2 and many other audio sources all coming into the mix," says Abbott. "The Vistonics interface allows me to manage them all reliably." Abbott has very specific ways he wants the shows he mixes laid out on the console, and the Vista 8 is more than capable of meeting that with precision. He lines up the K2 outputs and the live microphones across the first of the Vista 8's six virtual work surface layers; layer 2 has the show's live music ready to roll; the third layer is reserved for utility sources such as CD players, feeds from a remote voice-over room and the fiber-optic link to the show's post production room; layer four holds 19 mono and 8 stereo auxiliary inputs such as feeds to the house sound mix position and the dialog mix to the IFB; the fifth and six layers offer additional live music inputs and live audience. Abbott's hierarchy allows him to have the most active input sources available to him immediately and other sources set as scenes that he can access instantly as needed. "In a 30-fader bucket I have 180 channels at my disposal, and the Vistonics lets me move around the console just as I need to, instead of having to jump around," he says. "I can set up a mix in half the time it used to take me on analog, and that improves my working performance for my clients because it gives me the time to focus on other aspects of the mix, instead of focusing on managing it." Another way the Vista 8 makes Abbott's job easier and the shows he mixes better is the console's ability to do latency compensation at the sample-rate level. "I use outboard processing on some of the microphones on the show but not on others, and with processing comes latency," Abbott explains. "The Vista 8's delay functionality has sample-level resolution, rather than the millisecond level that you usually find. I can't get that level of functionality on other consoles." As much as Abbott likes the way the Vista 8 performs, he's also a fan of the fact that the Vista 8 is more than a product -- it's a platform that is both advanced and comprehensive and continues to follow an evolutionary path forward. "The Vista 8 is as state-of-the-art as anything out there, and as the industry moves towards commonality of platforms -- being able to use the same platforms for broadcast and live sound, for instance -- Studer has come the furthest in terms of getting the console applied to all the different disciplines you need a digital console for," he says. But at the end of the day, Abbott, for whom mixing music remains a passion, reserves his highest accolade of the Vista 8 for its sound. "I like the tone, the absolute richness of the sound of the Vista 8," he says. "The first day I opened up the faders on 'The Talk' and I thought, Wow, this really sounds great. The dynamics react as I like them to and the EQ is absolutely responsive. I could get used to this."